GLASS COATED HEATING ELEMENTS - Scale and sediment build-up on the surface of the element can lead to premature failure. A. O. Smith Glass Coating helps to prevent scale formation and extends the life of the heating element. RUST-PROOF OUTER BODY - Superior quality ABS outer body prevents rusting. The elegantly styled water heater matches kitchen and bathroom décor. HIGH RATED PRESSURE - The water heater has a high pressure withstanding capacity of 95 psi (6.5 bar equivalent to 65 metres water head), which makes it suitable for high-rise buildings. HI-TECH THERMOSTAT & CUTOUT - It has a superior Thermostat. In case a fault occurs and the water temperature exceeds the preset level, the Thermal Cutout cuts off the power supply to assure safety. 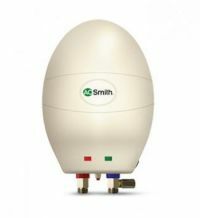 To Recieve updates and possible rewards for AO Smith EWS 3 (4.5 kW) White please sign in. To Recieve updates and possible rewards for Geyser/Water Heater please sign in.